Do You Really Want to See Richard Armitage Playing James Bond? I’ll grant this is fantastic looking and makes for great posing. Definitely has James Bond all over it (literally in this case), but is that the role you really want to see him playing? I ask because it is so confining. It’s a two dimensional character at best, and the actors who have played him seem to get stuck there. Is that what we want to see Richard Armitage, the chameleon and romantic, doing? Being stuck inside a roue’ whose lines are as predictable as the sun coming up tomorrow? As for what Richard Armitage wants, it should go without saying (but invariably someone says it *yawn* so I’m getting it out of the way with this statement) that he should choose to do what makes him happy. Certainly. But we’re consumers of what he does as an actor and are entitled to have a view of it. Obviously I’m not keen on him doing this, and a few years ago, I stated the reasons why. Further, I’m mystified that so many fans are interested in this role which does not seem to fit the trajectory of Richard Armitage, and he has even said he would rather play a Bond baddie. With all the rabid interest I see, and from people whose opinions I respect, I’m curious what is so appealing apart from the potential for great screencaps or gifs or other clips that are swoon worthy. I agree. Bond is a two-dimensional character and would really be a waste of talent. God no. Craig all the way. If Craig STOPS being Bond because he wants to move on to other things, a replacement needs to be found, and I agree that Bond is too much of a 2D character for RA to play. He played John Porter, and from the sounds of it, he had to really work to give him a third dimension. Bond would be like Porter, only much cheesier and without the depth. So no thank you. I would want to see him play any role he wants but the reason why I wanted to see him as Batman and/or Bond is that, simply put, these roles will likely lead him to great stardom. I want that happen. I want to see him take whatever other roles he wants to play once his name is better known. So that is about it. I am just speaking for myself alone though. @MistyMountain, you have a point. I guess I just see that others who have played Bond have not been able to move away from it easily. Wouldn’t particularly want to see him in the role at all, but the Esquire pics were very redolent of JB. No, RA definitely has the ability to play more insightful and much deeper roles. But my feeling as an admirer of his work is that I am quite happy to just sit back and allow him to make the choices he wishes to help him fulfil himself as an actor. I like the idea of Richard as Bond – or at least looking like Bond. And I think he would be phenomenal. However, I too would rather he procured a nice, meaty Bond baddie. The difference with Bale had a lot to do with the freedom given to Christopher Nolan and the script. I just don’t see that kind of complete dismantling and then rebirth of Bond being allowed by the Broccolis. They’re not that cutting edge. They have a cash cow and no one better mess with it. LOL! I’m sure whatever he chooses to do, I’m going to watch it. :D And I must see the Craig version of Bond! Been meaning to do that, but there isn’t enough time. I would be happy seeing Richard play anything he chose–my only real quibble with seeing him enter the Bond franchise is that it’s been going on forever and I’d like him to get the chance to create some new and wonderful characters. I agree. This franchise doesn’t seem to have any scope for development. I could see RA playing a Bond baddie, but would he be allowed to make him a sympathetic character as he did as Sir Guy of Gisbourne? Probably not. I agree with previous commenters – I’d love to see RA get more recognition for his excellent work! Let’s hope that somebody in Hollywood gives him the chance! Or in England. No, He needs to play Heathcliff in a really GOOD production of Wuthering Heights. He could do it as Craig has certainly. Daniel Craig is not just doing Bond, he has done other films and he has made Bond his in a completely different way. However though Richard is beautiful as Bond in clothes certainly I don’t particularly need to see him play James Bond unless “he” wants to do it. I want him to use his talent to the fullest and I believe that is really what he wants as well so I’ll leave it up to him. Even if he were mine to influence I wouldn’t do that to him. so so late to this party BUT…I have always thought he IS the captain in The Sound of Music. Perfection. And…am I the only one who looks at this picture and tho lovely and wonderful and fantastic it surely is…my eye only sees the top of his head wondering “what the heck?” Is the thing in the middle a fluff of hair? A leaf? The squirrel beard? A nesting bird? A weird part? HELP!!? Noooo, not Heathcliff! He’s just a scheming psychopath. :( Rochester I can get behind. Exactly what I was thinking! Mad Men. Perhaps it’s a sign that he would not abandon Bond films too soon. 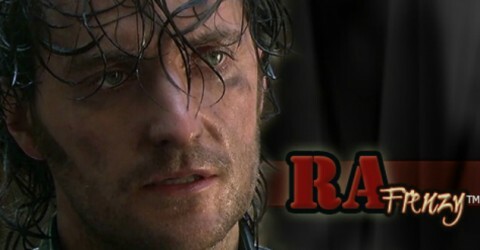 I would love to see RA on “Mad Men.” I think I read there will be 14 more episodes but they will be shown in two parts. Seven in 2014 and seven in 2015. I believe they will all be shot at the same time. I would definitely like to see him in something where he looks more like himself without all the prosthetics. I was thinking because they haven’t released “Into the Storm” we haven’t seen him in anything new since 2011 except as Thorin. Although RA looks fantastic in a tuxedo, I truly hope that Daniel Craig continues in the role for the foreseeable future. Craig’s 007 is the first one that I could find tolerable. The others make my skin crawl. IMHO, I hope that RA has the desire to get back on stage here in NYC or back in London. That would be an exciting thing for the audience and perhaps for him as well. Being that I am off to see ‘Betrayal’ today with Daniel Craig and Rachel Weitz, I trust that JB will be furthest from my mind as I enjoy the show ;). To follow up from yesterday’s comment, Daniel Craig was very effective on stage. No shades of 007 here! And if anyone wonders, he was very friendly to the folks who collected around the stage door. I was impressed. 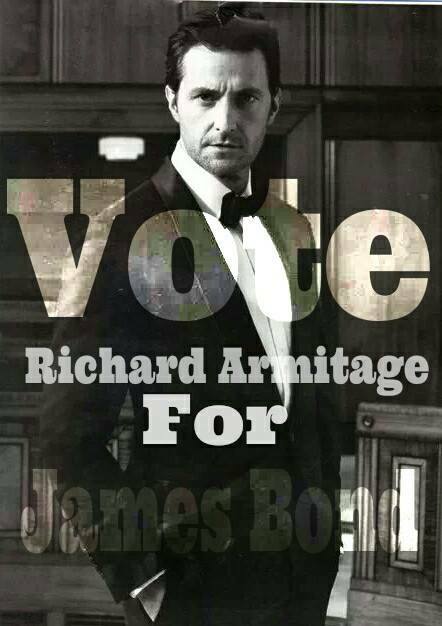 I WANT Richard for JAMES BOND!!! !Oh my gosh, this would be so so great…It is to be destined!! !He is an amazing actor and he showed in Spooks, Strike Back and in Hobbit….. I would LOVE to see Richard Armitage as James Bond!! He has so much to bring to the character. Rule out anyone who has played a recognizable Super Hero. Bond should be at least 6’1″, have a captivating voice (Connery, Moore), and have decent wit and charisma. I’d say Armitage would be excellent, with Timothy Dalton as M.. I would rather see Richard sink his teeth into a role with more depth. He is so talented and is fantastic at layering the emotions of his characters. Bond may not be the best fit for him as he is not a complex character that Richard could develop/interpret. He would look unbelievably gorgeous, though. At this point in his career, it would probably be helpful. I could be wrong.